Fall colors throughout Michigan are peaking. Red, orange, yellow, and russet leaves are everywhere: along country lanes, in rolling forests, and lining the banks of rivers, streams, and lakes. If surrounding yourself with colorful fall foliage makes you happy, now is the time to do it. Fall foliage reflected in Lake Michigan. One of the most wonderful ways to experience fall colors in Michigan is from the water. Water is everywhere in Michigan. It borders the state to the east, west, and north. It is found in the more than 36,500 miles of rivers and streams that flow through here. 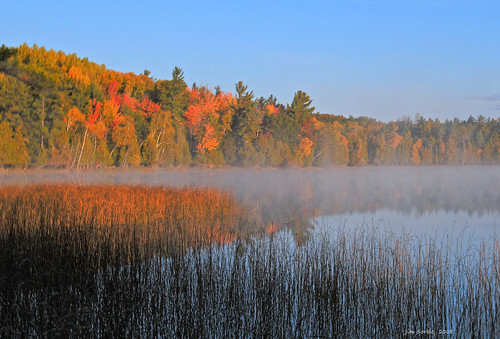 This fall, get out on the water and admire fall colors as they’re reflected in the water under your feet. Burchfield Park, on the Grand River. The Grand Fish in Lansing, on the Grand River. U-Rent-Em Canoe Livery in Hastings, on the Thornapple River. Spend a few hours in a canoe or kayak, meandering up the Grand or Thornapple Rivers, or circumnavigating a small lake. The fall colors will be magnificent and the fresh air will be invigorating. It will undoubtedly stimulate the appetite. After your paddle, stop by the pub at our Eaton Rapids inn and restaurant. Satisfy your thirst with a pint of ale and stave off hunger with a Black Angus Burger or a hearty French Dip sandwich. Then wander through our grounds and admire fall colors along the Grand River from a higher elevation. You may even be inspired to stay the night.